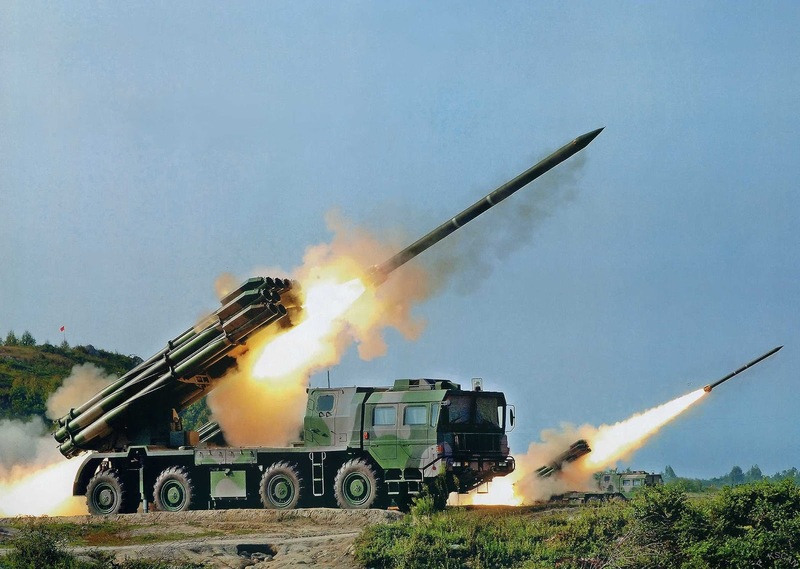 I’ve been mulling a post over the recent North Korean launches of Scud and now Nodong missiles, but I want to draw attention to a wrinkle that’s been neglected — North Korea’s new 300 mm artillery system. These may have been — may have been — the same launched that narrowly missed a Chinese airliner. Well, I should be careful about “narrowly missed” — this might be the South Korean Defense Ministry stirring up trouble. North Korea does seem to have neglected to file a NOTAM, which is not nice. Seeing the deep anger in China over MH370, Kim Jong Un has to think he dodged an artillery shell there. (Sorry, I couldn’t resist.) Lips and teeth or not, Kim Jong Un does not want to shoot down a Chinese airliner. In case you are wondering about the Russian and Chinese comps for the system, here are pictures of the BM-30 and PHL03. I’ve seen reports that China sold the A-100 to Pakistan. There are two possibilities that leap to my mind. The first possibility is that Pyongyang knows all this bluster about turning Seoul into a Sea of Fire with long-range artillery is, well, bluster. Roger Cavazos has actually tried to count launchers, count emplacements, estimate rates of fire and draw range circles for the DPRK artillery force. Although the expected casualties from an artillery barrage are nothing to sneeze at, Roger’s work suggests that the DPRK’s conventional artillery isn’t quite as formidable as popular rhetoric would suggest. Range is a major issue, something a 300 mm projectile helps out with. Second, there is always the disquieting assertion by Pakistan that it has developed nuclear artillery. I’ve been skeptical of Pakistani claims because a few hundred millimeters is pretty slim for an early generation nuclear weapon. North Korea might be interested in nuclear artillery, might try even if the system is unreliable and isn’t above stretching the truth for effect. After all, North Korea also paraded a truckload of weirdos carrying chestpacks marked with radiation symbols through Pyongyang. The Strategic Rocket Force started life as the Artillery Guidance Bureau. Who knows. It’s something to ponder. That’s curious… The PLH03 seems to be a faithful copy of the BM-30, but on closer examination, I don’t fully understand the second photograph. I mean, when measured on my screen, the rocket that leaves the front launcher is 14% longer than its tubes – that’s more than the length of its nose cone. I know it’s slightly coming toward us, but this should certainly not alter its appearance this much. The second rocket is also longer than its tube, in approximately the same proportion. However, on the BM-30, the rocket clearly fits entirely within the tube (and if were not to, the tube would be irrelevant). I don’t see how it could possibly have left the tube if it is bigger than it. But then, why would the Chinese alter a photograph to make their rockets look bigger than they are? Well, of course, there could simply be a bureaucratic reason behind this. Hiding their real size doesn’t seems interesting, since the observer can simply measure the tube to get it… unless of course their real size was notably smaller than what the tube would imply. Or there’s something that I’m missing. All in all, that’s weird, and I can’t make my mind about it. Anybody else? I think the rocket you’re seeing in the second photo is actually being fired by a launcher behind the one visible, between the two visible ones. May just be a quick photoshop job in the PR department to make the image clearer. @George William Herbert : Nice explanation, this closes this point. Thank you. Taking into account the fact that the length of the rocket is measured from a point to its side to a point at its center, whereas the tube is fully measured on its side, I compute that the rocket is 15% longer than its tube. This one seems only 11% longer than its tube, with a higher uncertainty. Also, the smoke from the front rocket properly envelops the front launcher, the exhaust flames on the back of the truck are correctly aligned with both the rocket and the front launcher, and the rocket is aligned with the front launcher, whereas it is located higher than it should be if it came from the middle launcher. I’m not saying that your explanation is completely impossible, but then, it would imply a good edition with regards to the smoke, exhaust flames, and rocket position, BUT a bad job with regards to the rocket’s size, BUT a good job in that they also increased the size of the rocket in the back, so that the fact that the front rocket had been made too big becomes non-obvious. The shutter-speed effect might explain the different elongation percentages for the rockets near and far from the camera. If it is sweeping the image left to right, it captures the tail as it leaves the tube, but by the time its get to the warhead it has moved forward. @Aaron Tovish : Interesting… I did the maths in reverse, using Cthippo’s video for the speed of the rocket. This level of deformation (for the front rocket) implies that the warhead was scanned 30ms after the tail, which leads to a time for taking the entire image of approximately 100ms. I don’t know much about digital photography, but this doesn’t strikes me as absurd… In fact, your explanation looks quite convincing. Thank you, I learned something! 1n image length of 100ms would give a shutter speed of 1/10th of a second, which is fairly slow for photography, but not unheard of. A modern digital camera with image stabilization will take a decent handheld picture down to 1/8 second or longer. I checked to see if there was any exif data which is recorded as metadata on the image with information like exposure length and aperture, but somewhere in the processing this got removed, as is normal. I did find one image of a BM-30 launcher on parade with the noses of the rockets out ahead of the launchers, but I suspect this was just done to look good fro the crowds. Like the American MLRS, I’m pretty sure the tubes are normally capped at the factory to keep rain out. “Warranty void if seal is broken” and all that. Compare to the thumbnail in the above video, they are not the same. The Hatf-9 is smaller and simpler fabrication. M-20 is only 400mm. 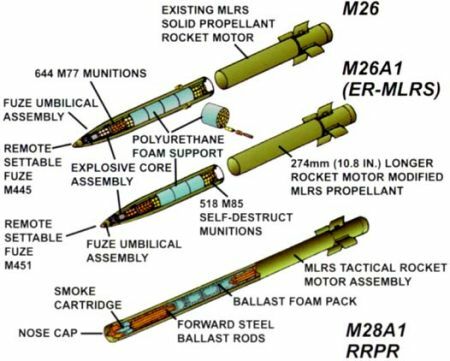 I am skeptical of a 300mm MRL as a nuclear delivery system. First, because 300mm is probably too small for a first-generation lightweight nuclear device, save for gun-assembly devices that would require extravagantly large amounts of North Korea’s scarce HEU supplies. Second, because MRLs in general are a poor delivery system for nuclear weapons. And third, because the North Koreans already have the KN-02 “Tochka”, which would be in every way superior to a 300mm MRL for this purpose. This makes much more sense as an improved conventional (or chemical) weapon. For traditional MRLs with unitary warheads, you generally want the rocket to be as small as possible while still having the ballistics necessary to reach the target, so as to saturate the target with the largest possible number of weapons. That typically comes to something in the 100-125 mm range. Once you have the technology to deploy submunitions aka “cluster bombs”, a smaller number of larger rockets starts to make sense, with calibers of 240-300 mm being favored. North Korea already has 240mm MRLs, but evolved from an old Soviet design that used large unitary warheads. If they have made the leap to a juche first-generation submunition warhead, the new 300mm system would seem to be ideal for delivering it. Submunitions, unless filled with nerve gas, would not be ideal for countervalue strikes against Seoul; they don’t hit hard enough to kill people in shelters or basements and they don’t collapse buildings. Unitary warheads could be deployed for that mission. Otherwise, the system would seem optimized for attacks against ROK and US forces, particularly those trying to move north into the DPRK. Most nations seem to go to the larger MRLs for the increase in range, which is I suspect the attraction for the North Koreans. Range seems to scale in a reasonably linear fashion from rocket diameter. The Soviet BM-30 system, which this is probably a copy of, has a range of 20-70 KM for cluster munitions and 25-90 KM for unitary ones. Assuming the NK variant is similar this would mean that a single vehicle could deliver a payload of 12 rounds each with 243 Kg of HE on a target up to 90 Km away within 40 seconds. That may not actually destroy a building, but odds are it will stop whatever was going on inside for an appreciable period of time. Throw in a couple of white phosphorous rounds into the mix to start fires and you’ve got a very effective carpet bombing system for use against soft targets. One salvo against an apartment complex or factory might not destroy it, but if the goal is disruption and panic, then mission accomplished. Distance from NK border to the center of Seoul is ~45 km but getting artillery right up against the border isn’t straightforward. The old well-fought-over line of control has defensible positions on both sides with outlook. A few kilometers makes a difference. One of the reasons people used to get worked up about the Koksan SPG was its 60 km range meant striking Seoul with easy deployment. 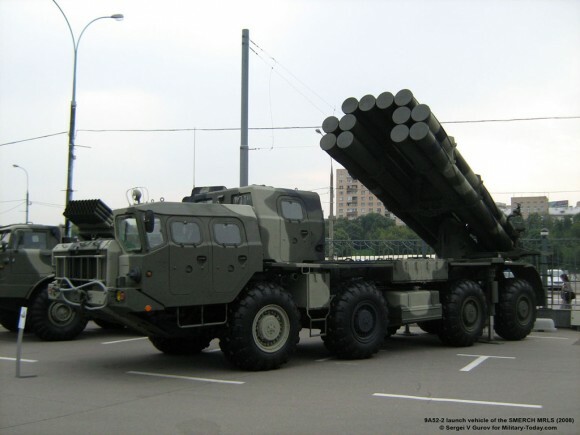 The 240mm rockets (Fajr-3) have 43 km range. According to Jane’s, North Korea has upgraded their 240mm rockets to give 70 km range; plausible given the performance of similar foreign systems. This would seem to be a more efficient approach if all they want is the range to hit downtown Seoul; developing a new system for the sake of a larger caliber would seem to suggest that warhead volume is the driving factor. It all depends upon how badly the North Koreans (or Pakistan) feel they need such a capability, either for the tactical/battlefield use, or for placement on longer range systems. Recall that the W9 of 1953 was for a 280 mm/11″ artillery piece and though it was using 50 kilos of HEU, the follow on W19 of 1955 and W33 of 1957 (an 8″/203 mm shell)got lighter and used less fissile material. And remember these were based upon 1940s munitions engineering being fired out of a field gun, not launched on the front of a rocket or missile. The biggest selling point for these HEU/WGU/gun systems is that they do work. They may not be as efficient as the various implosion techniques and be “crude” by comparison, but they give admittance to the “nuclear club” all the same with all that entails. The estimates that David Albright gives in his article from 2012 at 38North (http://38north.org/2012/10/dalbright102312/) of the DPRK having at least enough for up to 11 such weapons, assuming 20 kg HEU/WGU per weapon, and their ramifications should be taken much more seriously than the regular media usually portrays them. If we posit that ranging downtown Seoul is the only goal, then CEP can be pretty huge and still reach valid area denial targets. Two stage rockets, and really crappy rockets with smaller stabilizing fins, will probably do just fine. John’s point about bomblets and building collapse is valid, but one can view a large urban target either as a small building collapse target or as a widespread fires target, from a purely conventional weapons perspective. A highrise downtown area is less likely to suffer building collapses with any unitary warhead short of a multi-ton unit; fires, particularly started by submunitions big enough to penetrate a window or drywall / exterior wall facade first and with sprinkler reactive pyrotechnic loads, can generate a lot more damage per unit submunition mass. And even with high failure rates, the number of fires it would take to overload the civil defense / firefighting forces available is not that high.